Kevin and Carol joined Mission Aviation Fellowship in January 1981 and have been on staff ever since. They moved from Brisbane to Ballarat where Kevin worked as a Licence Aircraft Engineer. During their 5 years in Ballarat three of their children Kylie, Katherine and Kristen were born. Towards the end of 1985 the family moved to Papua New Guinea where they lived and worked in Mt Hagen for the next 9 years. Kayleen was born during this time. 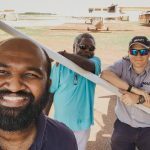 They returned to Australia at the end of 1994 to take up a role at Aboriginal Aircraft Maintenance & Services in Alice Springs where they worked there until the end of 2002, when MAF’s Management Agreement with Aboriginal Air Services was concluded. MAF had a need for another engineer in Arnhem Land and so they were re-located there for the next 3 years. Another need arose at MAF North Queensland and so they moved to Mareeba in January 2006. Kevin has fulfilled the roles of Engineer, Chief Engineer and Hangar Supervisor over these many years. They have both served in local churches through various areas of ministry. 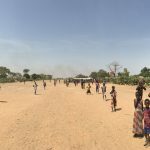 Please continue to pray for Kevin and Carol that God would use them for His Glory through their enabling of the delivery of relief and development in remote places in Jesus’ name.